Was That an Insect or a Drone? The insect drone takes on the functions of larger UAVs, but reduces the larger drones down into a miniature undetectable device. Oscar Williams-Grut for Business Insider: Analysts at global investment manager Bernstein believe the "age of industrialization is coming to an end," with robots set to destroy manufacturing jobs globally. That may not sound seismic. After all, the industrial revolution happened hundreds of years ago and manufacturing jobs have been the minority of all jobs in the West for decades. But Bernstein is arguing that the nature of capitalism is undergoing a fundamental change. The Omron Adept Lynx Cart Transporter is an Autonomous Intelligent Vehicle (AIV) designed to attach to movable carts and transport them from a pickup location to a drop off location. Applications include line-side inventory replenishment, moving flow racks, transporting Work in Progress (WIP) between process steps, and moving finished goods to the warehouse. The Lynx Cart transporter leverages Natural Feature Navigation to autonomously find a path through the facility without the need for any facility modifications necessary. 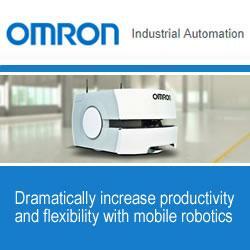 Learn More About Omron Adept Technologies, Inc.